Monica Greco's sculptural dish perches on the edge of your sink, letting excess water drain away. In the world of bathroom decor, the soap dish is sadly often an oversight—and kind of a soapy mess. This sculptural soap rest from ceramicist Monica Greco is designed to perch on the edge of your sink, letting excess water drain away and extending the life of your bar of soap. 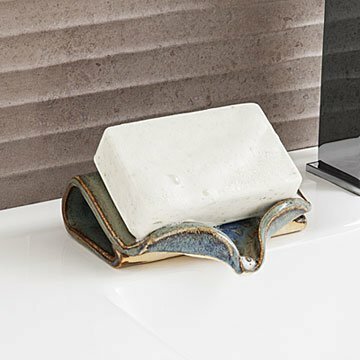 Monica applies her background in research science to developing special glazes, which give the piece an earthy loveliness and earn it a place of honor in your master bath or guest washroom. Handmade in Maryland. It’s no surprise that Monica Greco takes a scholarly approach to her work as a ceramicist—her first career was in higher education. After earning a PhD in experimental psychology, she taught statistics and research methodology. She began pottery classes as a hobby, but the more she developed her creative abilities, the more she began to see how her research skills could be combined with her new craft. She applied her experimental mindset to creating glazes as well as the functional design of her pieces. And after 20 years in academia, Monica made the transition to being a full-time potter, producing work that is as innovative as it is beautiful. This Dish is a lovely, functional piece of art. It sits on the edge of my sink and drains directly into the sink. No more soggy bars of soap or watery soap dishes! Yes, I would definitely buy again. Love them! Bought two. Exactly what I hoped it would be/accomplish. Lovely dish and is a nice addition to the flat rubber soap holder it replaced. However the angle is not steep enough to drain most of the soapy water. Come back the next day and there is still a lot of soapy water remaining in the lip that needs to be tilted and drained. Going to try and raise the rear with rubber stick ons. Solved our bar soap getting gross, so we don't need plastic bottle soap anymore. I have this on my shower shelf. It may work better on a vanity, but it doesn't dry the soap completely in the shower. Maybe if it had perforations for air instead of just the etched design where the back of the soap rests it might dry better. It is still a big improvement over a typical soap dish, and it is very attractive. One was a gift and one was for myself. I had used a flimsy plastic item with the same intent in the past. However, yours is much sturdier, decorative and a great conversation piece when a guest comes out of the bathroom. One of my young granddaughters came out saying....."Ooh La La, what a soap dish!" I bought this for our new shower. I have yet to use it but it is the only thing I have seen that should help keep the shower shelf clean. There shouldn't be any soap build up on the shower inset and that will be great and well worth the money. Plus they are very nice looking. I just with that they came in different designs and colors. It's even prettier than it looks online. I love the design. I just may have to invest in the matching toothbrush holder!